Samsung has recently taken a number of decisions with its Galaxy S6 series which has received mixed reactions. The most obvious one has been stripped of removable batteries and microSD cards provision. This move makes the phone similar Apple’s iPhone but a lot of Samsung lovers did not understand the logic behind the company decision. Personally, as a Samsung-user myself, I preferred the Galaxy S series because of the expandable memory option. It’s not just about the space, but is something goes wrong with the phone, at least your data is still available in the memory card (that’s if you haven’t saved on iCloud/backup). Samsung has said the firm found that consumers really want the option of big screens but it has also admitted that people don’t want a lot of extra features with it. 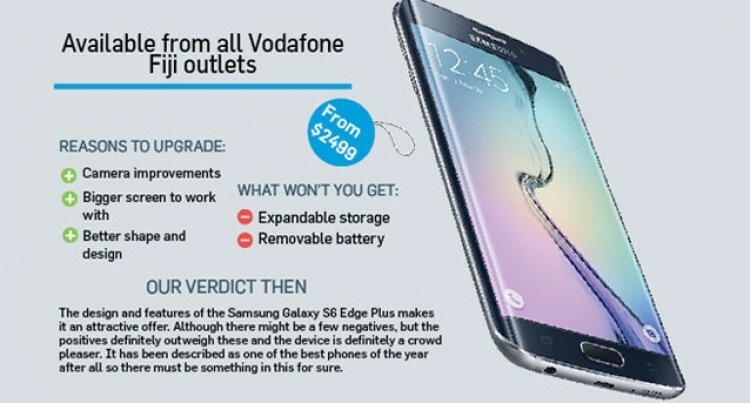 This week, we get hands-on with the Samsung Galaxy S6 Edge Plus which has been provided by Vodafone Fiji for review. The Galaxy S6 Edge Plus exists for people who want larger S6 Edge but without the extra features of the Note 5. Let’s first look at the design – the first thing anyone looks at before going into the details of features etc when making a buying decision. With its metal frame, curved from glass front and stylish glass back, this phone simply stunning and very appealing and indeed comparable to iPhone 6 Plus. The Edge Plus is 5.7” compared to Edge which is 5.1”. The Quad HD Super AMOLED dual-edge display is bigger and comes in slimmer and lighter body. The phone’s weight makes it easily manageable with a good balance. It fits well in your palm. But the glass makes it seem like the phone might slip out of your hands. This will however be easily managed if you use a phone case/cover. Fingerprint scanner is a great security feature to have in your phone. It will ensure unwanted people do not access your personal contents without your knowledge. The Galaxy Edge 6 Plus’s fingerprint scanner is similar to that in other S6 models – better than those in S5 models. As in other S6 models however, the fingerprint scanner works perfectly and it easily recognised my thumb in the first attempt unlocking the phone. In fact, the scanner is very close to the fingerprint scanner present in Apple’s iPhone. The fingerprint scanner for Samsung is now more important than every as it begins its global roll-out of Android Pay and Samsung Pay. Unfortunately, I am not sure whether the Android Pay or Samsung Pay will be available in Fiji. I simply loved the camera features and camera picture quality of the S6 Edge Plus. The rear camera is 16MP while the front camera is 5MP. Whether you select auto mode or any other specific mode for your needs, the photos taken are still amazing in almost every scenario. The selective focus mode gives you to option to take a picture of an object less than 50 cm away to focus on it. And if you love taking selfies, but find pressing the button in front a bit off, this phone has made it easier. The camera has advanced selfie technology and a host of great filters that accentuate your best features. All you have to do is put your finger on the heart rate detector and the picture will be taken. For photos and videos both, there is auto real-time HDR option which captures every detail you want to remember by using different exposure levels for different areas of the image. There are instances when you need to capture an image instantly or when you need to slow down things. The camera launches, I noted, fast enough to capture that moment instantly and then there is the slow motion option which lets you capture things in a slow motion. This gives you full control of the situation. One of the mode also allows you to capture Panoramic view for things which too wide to capture in one image alone. It is simply the curved display around the sides of the S6 Edge Plus which gives it a unique looks distinguishing it from the other devices. It’s your own Edge so you get to choose where the Edge handle goes – left or right – top left or top right – or bottom left or bottom right. This gives you convenient and immediate access to all the Edge feature wherever you are on your phone. Reaching out to your favourite contact has never been so easier which can be done simply by swiping inwards from the Edge Handle. To top it off, you can assign colours and places on People Edge to five or your favourite contacts. When you put your phone face down, and a call from one of these people comes in, their colour will pulse along the edge, lighting up the surface below to let you know who is ringing. You can cancel an incoming call by putting your finger over the heart rate sensor – amazing no? At the same time, the Edge is also home to five of your most frequently used apps. You can create shortcuts to your favourite apps and have them right at your fingertips. But I have to admit, if you do not use these features, then the phone will in fact be quite useless. And if you still buy the phone, you need to train yourself with the Edge features to make the most of what the phone offers. To be honest, I found the battery life of the S6 Galaxy Edge to be drained out way too fast. But you also have to ensure you do not have a lot of background apps running. I guess part of the reason would be bright and high-resolution of the screen which takes a lot of power. Having said that though, naturally, the phone has a lot of features and thereby the internal battery would struggle to cope with demands of someone who is constantly using the device. On the plus, the device does charge quite fast. You can get up to 50 per cent charge within just 20 minutes but to go from zero to full takes 90 minutes at least. But the 50 per cent may give you the desperate boost you need in your hour of rush.